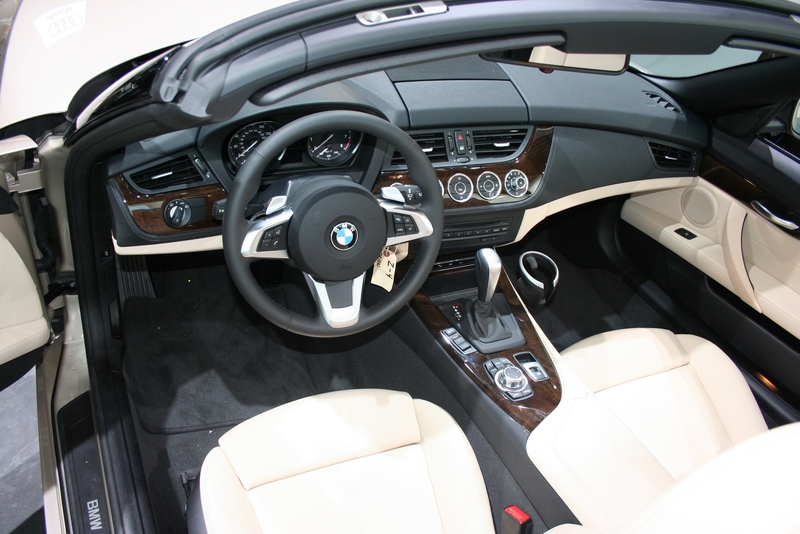 And we’re moving further with our coverage from the Detroit Auto Show by showing you some new photos of the 2009 BMW Z4 interior. Just yesterday, we published the latest and greatest shots of the 2009 BMW Z4’s displayed there, but we left on purpose all the interior photos. But before I go ahead and post them, I would like to tell you about my mini interview with Miss Nadya Arnaut, Interior Designer of the new BMW Z4. As I mentioned yesterday, both Julia Blasi and Nadya are just fascinating, pleasant and very approachable. As you can see or already seen in the CS Concept photos posted all over the web, some interior design elements have made their way into the new BMW Z4. The round chromed AC control buttons are the evidence that CS Concept served as an inspiration for the Z4 interior design. In our less formal conversation, Nadya stated that Z8 helped her design the interior of the new Z4, but I have to admit, after looking again at the Z8 photos, I just don’t see any common design elements. She once again reinforced what we knew, the return of the driver oriented dashboard as we have seen in the 7 Series as well. The idea behind it is to connect the driver immediately with the car and create those “emotions” that Julia Blasi was referring to in our interview. The new Z4 is all about the driver and the pleasure to drive, with a simple interior design and usability being the prime factor. When asked why she decided to go with the round shaped AC buttons, she said that the driver should be able to operate the car’s controls without giving it much thought or spending time trying to figure them out. And what’s best than rotating buttons that offer you that simplicity. Maximizing interior space was also one of her top priority and as I have seen, despite the two seater design, the new Z4 offers plenty of interior and cargo space. For those of you that are golfers, when the hardtop is whether up or down, a golf club will slide from your trunk all the way to the center space between the seats. If the hardtop remains up, another golf club can be placed in the trunk in an horizontal position. Same applies to skis. Also, behind each seat, there is a small cargo space that can hold purses or laptop bags. At the end of our interview, in behalf of our blog and readers, I took the time to congratulate her on the best BMW interior design we have seen so far. As I told Miss Blasi, I really hope Nadya will have a hand in some future BMW vehicles. Nadya is a BMW DesignworksUSA employee based in Newbury Park, CA and she travels all the time between California and Munich. Also, she graduated from an Art School in CA and even more interesting, she is the one that designed the Nilfsik Extreme P Series vacuum. Enjoy the photos and as a bonus, I have some new ones with a red interior. Previous post Detroit 2009: Mercedes-Benz Blue Zero Concept – Mini E Competitor? The seating position and the span of dash across the instrument panel to the passenger side, I can see Z8 in that. The cockpit wraps around driver more like Z8 did as well. I’d be really interested to see how taller drivers fit in. I’m 6’3. What I like about BMW and Mercedes, (gotta give Mercedes the point for this one tho), the seats have a very wide range of positions and can be lowered right to the floor where as Lexus is only meant to fit a tight group of ppl, tall ppl not included. Very nice, I’ll have to sit in one when they come out. But if any tall guys have sat in, lemme know! The cupholder isn’t fixed, it is similar to the one in the 6 series. It has a “fold-out” mechanism and be folded back into the dashboard. This image (https://www.bmwblog.com/wp-content/uploads/img_6508-1600×12001-498×332.jpg) is from a 7 series, not the new z4. The 35i witht he 7 gear trans that has this stick has the idrive on the left not on the right. And the last 4 photos are also from the 7. @ferenc: Fixed now, the uploading process got messed up. She did a great job. I love the sculptural quality of the dash; the way it curves around the driver and passenger. I also like some of the carryovers from the E85- the cluster pod for the speedometer/tach is exactly the same. One caveat- I wish they’d move the start/stop button from behind the steering wheel. I know on my 3-coupe (the button is in the same position) I end up fumbling around searching for the fob slot and then your hand has to find a button you can’t see. It’s a small complaint….and eventually you just learn where things are, but, myeh- it’s in the wrong place. One thing I love is the attention to detail and the upgrade of materials- check out the craftsmanship of the leather stitching on the dash that runs parallel and under the chrome strip. Sweet. I’m 6’4 and fit into the current Z4 with more than enough room. Even my buddy’s M Coupe doesn’t make me feel claustrophobic. Compared to a Porsche Cayman, the interior of the Z4 feels very tall and spacious. The Deep Sea Blue Z4 with fine line interior wood trim has either leather or leatherette on the top of the dash as you can see the stitching. These pics show the normal BMW dash material (rubber coated plastic). Can you confirm the difference of materials and whether the other one is leather or leatherette? Thanks for all the outstanding coverage!! I haven’t seen a 6spd manual car yet, hopefully they are not sacking the manual transmission! I’m 6’4 and I have been digging this car ever since I saw it on this web site. Do you think my hight will be an issue? When you say golf club do you mean golf bag? I’m not sure one or two golf clubs help. Maybe to the range? One thing that surprises me in pretty much all the recent bimmers, given their amazing attention to instrument panel design: The center console panel (from ashtray back to the arm rest) is a complete mess, full of mis-matched stuff with no sense of design integrity. Looks like they just cut out a hole there for whatever didn’t fit elsewhere. Yes, the iDrive controller is where your hand needs it to be, but there’s no sense that the panel and controls there were laid out with any overall design in mind. You’ll probably be fine. I’m the same height and don’t have a problem with the current Z4, I’ve got more than enough room actually. @Lazaro: I’m 6.3 and I fit comfortable in it. Great! And how do you like the current Z4? @Lazaro: Simply amazing!! Trust me, it looks much better than in the photos. Those climate controls remind me of the manual climate controls from the 2002-2006 Toyota Camry. I wounder what the new 5 series interiour will look like…..
A bit of 7 and Z4/CS? Isnt the 5 ment to be the sporty car compared to its general competitors? If so it must have a kinda sporty interiour…..So more CS then 7?